This year's Israel Film Academy award winner "The Band's Visit" is continuing to reap awards worldwide. The film, which was directed by Eran Kolirin, reaped both the Grand Jury Special Prize and the Audience Award at the Copenhagen International Film Festival as well as the City of Athens Best Director Award within 24 hours. A scene from "The Band's Visit"
Makram Houri also sat on the Copenhagen Festival panel of judges. A good selction of Israeli films were presented this year at the festival including "The Meduzza's" by Shira Geffen and Etgar Keret, "The Summer Vacation" by David Wallach, "Beaufort" by Yossef Sider, and "The Bubble" by Eitan Fox. After being awarded eight Ofir prizes on behalf of the Israel Film Academy, "The Band's Visit" is now preparing to run for the American Oscar. The film, which has been sold for distribution in 52 countries worldwide, will be commercially released in Greece this month, and it is hoped that the Athens award along with the prizes awarded at Cannes, Munich and Jerusalem will assist in attracting Greek audiences to the theaters. 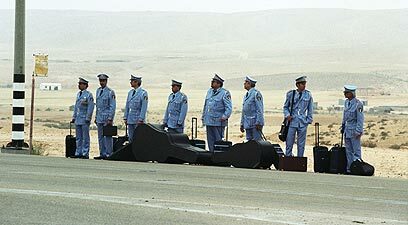 "The Band's Visit" starring Sasson Gabai, Ronit Elkabetz, Khalifa Natour and Saleh Bakri tells the story of an Egyptian police band that lands in Israel and mistakenly arrives in a remote town where it is forced to integrate with the local community. See all talkbacks "The 'Band's Visit' continues to reap awards "